It was celebration time at Indian Association of Investment Professionals (IAIP) as it completed 10 years of existence. The event organised in Mumbai on April 21, was graced by many senior charter holders along with esteemed representatives of the CFA Institute. 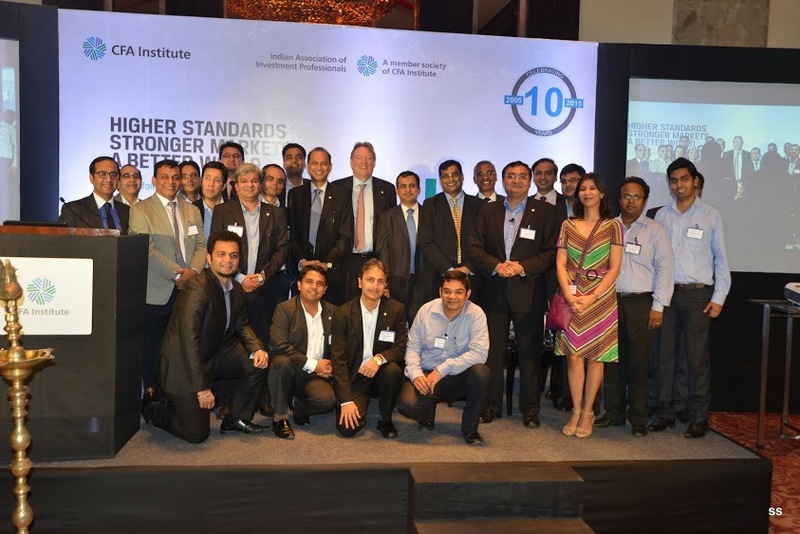 The event was flagged of by Sunil Singhania, CFA, who described the 10 year journey of IAIP. Though there were many CFA charter holders from India scattered around the globe it was challenging to get together 50 members, a minimum number of members to form a society at that time. Finally, having met the requirement, the society was registered in 2005. He acknowledged the commitment of the volunteers including the ones who were instrumental in setting up of IAIP and its functioning in early years but have now moved to other profiles or geographies. Jayesh Gandhi, CFA re-iterated the mission of IAIP, which is to promote ethical & professional standards in the finance industry along with delivering value to members. IAIP has done 100+ continuing education events in the last 12 months across the country and for the benefit of members many of these events were webcast. Today the society has grown to 1300 members along with 2000+ Charter Pending candidates. The endeavor of the society is to gear up the infrastructure to serve multiple expansion of the member base. Jayesh also emphasised the importance of volunteering and encouraged all the members to contribute towards building the society. Paul Smith, President & CEO at CFA Institute, emphasized the importance of societies in CFA Institute’s mission of building investment profession. The CFA India office has been set up to help CFA Institute work better of the ground to promote the CFA designation as well as help IAIP deliver member value. Paul accredited India’s Federal system, democratic values and the vibrant economy. He believes the society and member base would grow rapidly and expects IAIP to play the big brother role in the south Asian region where many countries will have new independent societies. Paul announced that SBI Mutual fund is the first mutual fund to have signed Asset Managers Code of Conduct. Chetan Shah, CFA, Director, IAIP put together a fantastic presentation of IAIP’s 10 year journey. This presentation detailed the key milestones of the IAIP over the years, various Awards from CFA Institute and included pictures of members, Speaker events, Research Challenges, India Investment conferences, etc. It was a great trip down the memory lane. The presentation is available on India page CFA Society. Vidhu Shekhar CFA, announced a formal opening of the CFA India Office and introduced the CFA India team. This entry was posted in Events, Happy Hours, Mumbai and tagged Amit Khurana CFA, Anil Ghelani CFA, Aviral Jain CFA, Biharilal Deora CFA, Chetan Shah CFA, Elizabeth Varghese, Jayesh Gandhi CFA, Jayna Gandhi CFA, Jitendra Chawla CFA, Jitendra Marchino CFA, Kishor Bagri CFA, Kunal Sabnis CFA, Mansi Panchal, Namit Arora CFA, Navneet Munot CFA, Paul Smith CFA, Rohit Rebello CFA, Saurav Mishra CFA, Sonia Gandhi CFA, Sunil Singhania CFA, Vidhu Shekhar CFA, Vinay Bagri CFA. Bookmark the permalink.